Coldplay and Beyoncéare giving us just another reason to get hyped for their upcoming Super Bowl halftime show. The Grammy-winning band just released their visually stunning video for “Hymn for the Weekend,” the lead single from their seventh album, A Head Full of Dreams. Beyoncé joins Coldplay in Mumbai, India during a colorful festival celebrating a religious holiday. She plays a film star who is seen on television sets and plastered on billboards across the city. Chris Martin winds up seated in a movie theatre watching Beyoncé sing while wearing elaborate dresses, jewelry and henna tattoos. 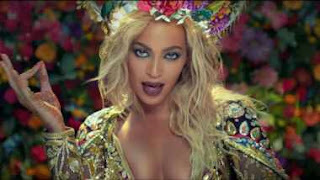 Next up, Beyoncé is scheduled to appear onstage alongside Coldplay for their Super Bowl halftime performance Feb. 7.